Imagine a river of blooming geraniums winding through your garden. 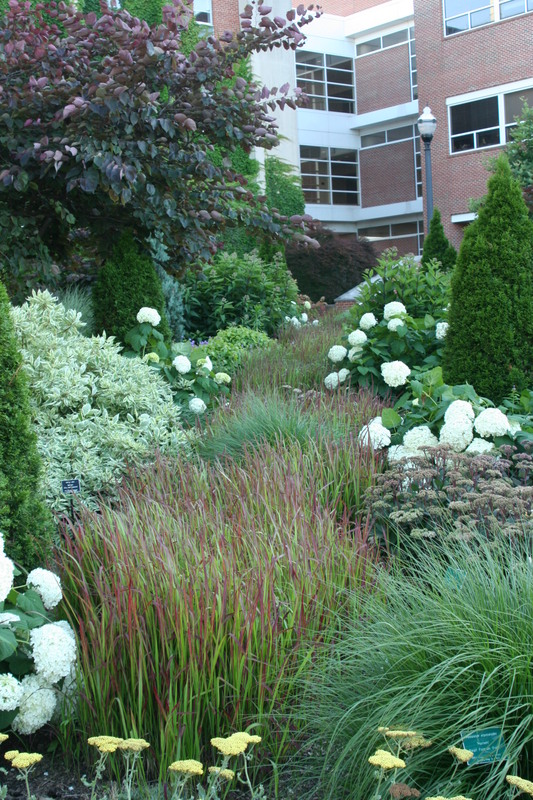 At the keynote presentation at last week’s American Public Gardens Association conference, nurseryman Adrian Bloom shared his signature “river” designs. He’s created these rivers at his personal garden, “Foggy Bottom”, in Bressingham, England, as well as several garden installations he’s led in England and the United States. Conference attendees got a chance to view one of his “river” installations at Ohio State University’s Chadwick Arboretum and Learning Gardens. In just one day in September of 2005, Bloom led a team of 100 volunteers who transformed a 4,500-square-foot space into a dramatic garden showcasing 1,800 donated plants which were selected for their year-round color and interest. Here, his “river” features plantings of Geranium ‘Rozanne’ and Imperata cylindrica ‘Red Baron’ (Japanese blood grass) that flow through the garden and cross one another in the middle. 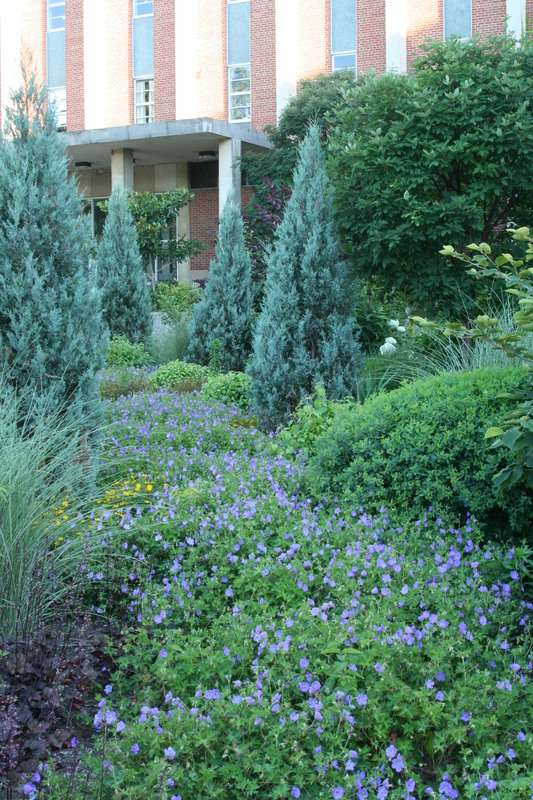 Key plants are repeated along the rivers to lead visitors’ eyes diagonally through the garden from corner to corner. Select robust plants with year-round interest. Possibilities include Brunnera ‘Jack Frost’ , Echinacea ‘Kim’s Knee High’, Geranium ‘Rozanne’, Heuchera ‘Chocolate Ruffles’ and Imperata cylindrica ‘Red Baron’. Create the river in a meandering line rather than a straight, canal-like one. Add banks along the river with contrasting plants that are taller than the river ones. Extend the seasonal interest by intermixing plants with winter and early season features. Try a bank of colored-stem dogwood or rivers of bulbs. Experiment with different possibilities. Consider a river among grasses, around trees, through woodlands, down slopes, beneath bridges and more.